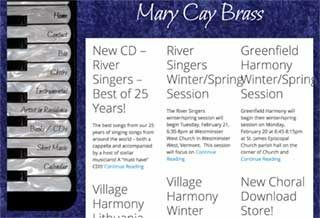 MaryCayBrass.com supports the work of a local musician who leads several choirs, teaches dances and choral singing. She had a site that had gotten out of date, she wanted to sell digital files of her music and her friend and original developer no longer had time to serve her needs. I used the basic design concept from her original site, and adapted it to work well on all devices. We sell downloads and physical products using Easy Digital Downloads. The shipping calculators are limited with EDD, but we went with the single shopping cart as she anticipated that most orders would be for downloads. A function of the site allows Mary Cay to upload pdf files of music for her choirs and make these files available through logins for the different choirs. I was happy to learn about this plugin, and will use it on other sites in the future!